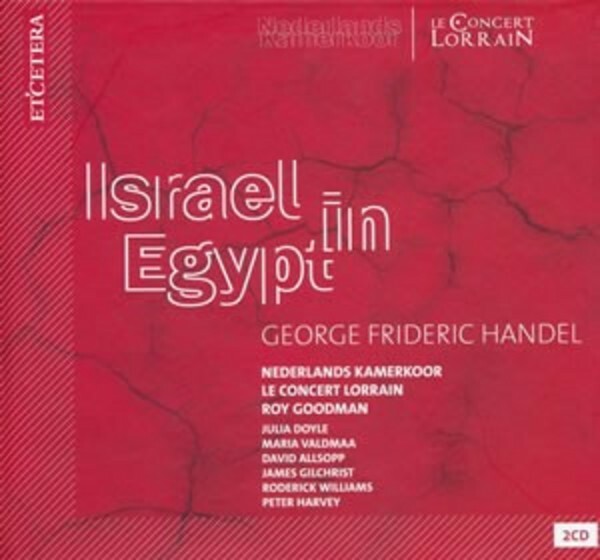 Israel in Egypt is without a doubt one of Georg Friedrich Handel’s most captivating oratorios. One that has an unusual role set apart for the choir. The biblical story of The Israelites crossing through the desert to the Promised Land and the plagues God spills over Egypt are sublimely captured in Handel’s score from 1738. The Nederlands Kamerkoor and Le Concert Lorrain have recently made a very successful tour with this oratorio through France and Germany. The much-celebrated Roy Goodman conducted an intensely charged concert in the Verdener Dom during the Musikfest Bremen. The riveting concert was recorded live by Deutschland Radio with James Gilchrist, Peter Harvey, Roderick Williams, David Allsopp and Julia Doyle performing the solo parts of this magnificent work.